One final night on a lumpy desert floor, despite the sleeping mat. One final night and morning of wearing the same clothes for over a week. One final visit to the camp toilets, one final dried meal, one final painful, squeezing tired and now slightly swollen feet into trainers. My tent mate Leah and I were slightly delirious this morning – laughing with the anticipation of this beautiful, crazy, extraordinary tough week being over… At 9 am, we all launched ourselves one last time over the start line to head the final 8 km into the centre of San Pedro. 8 km doesn’t sound like much. But after 242 km over salt flats, rocks across freezing rivers, hot sand dunes, Mars like terrain… it seemed like a marathon lay before us. And so we counted down and set off with whoops and whistles – this filthy looking bunch of runners (a dubious description at this point) headed along the dusty, bumpy, uneven roads! As it was the last stage, everyone was going for it… sort of. You have to laugh at the sight of people who can normally run/stride fast and strong, reduced to a sort of hobbling jog as each pain pushes pressure on those blisters, sore ankles from strained tendons and torn ligaments. Me… right, this was it… 8 km. I wanted it done and dusted and apart from two short walks of about 100 metres, I ran/shuffled all the way. I tagged onto the end of four Chinese runners who had a good plan of teamwork and were sticking at a steady pace in single file. For about 2 km, I sat in their slipstream. But, as we entered the dusty outskirts of the town, my adrenaline began to increase and I could smell the finish line. The road was one I had run on a week ago. Its familiarity helped me as I came to the crossroads over the Main Street, high-fiving one of the volunteers stationed there making sure we were going the right way. The odd thing was the occasional tourists taking pictures of us! I turned right into the street that led up to the town square. I could see the chip timer 200m ahead of me… and from somewhere my legs found their sprint. I ran into them as they logged my time and said all I had to do was cross the finish line 100m further on, no need to run. But in my book, you run over those finish lines! I ran up the hill to the sea of blue (all the course volunteers/medics/race director) and other already finished runners and crossed under the finish line banner. With my arms aloft, hopefully smiling, I jumped high in the air as the medal was hung over my neck by Mary, the course director and I embraced her. So, it is 3 pm here at camp. We look a bit like the walking wounded as folks hobble across the dusty ground to the loo, or to the camp fire to get hot water for hot food, or as they stumble out of the medical tent, feet taped, padded and strapped. It is official, we are filthy and there is a pungent smell of sweat every so often. It’s a relaxed atmosphere as the memory of the pain from yesterday’s slog fades into pleasant memory. Everyone is comparing notes on how they fared, or which bit was the worst. It was a hot day and blisters were in abundance. I admit that my feet, whilst not pretty, are not too bad… a few drilled toenails to release the fluid trapped underneath, but otherwise I have fared quite well. The images of yesterday’s run are still extraordinary. It has been an extraordinary week – the landscape and terrain has been almost indescribable. Yesterday it felt like we crossed several planets, each with its own unique surface. If I come across more salt flats anytime soon though, it will be too soon! The gods have been in my favour – 2 of the 4 “crisp packet” air mattresses in my tent have died a punctured death – nothing to do with me! Sandy dust is everywhere – none of our clothes are clean. Boys of the MDS, I’m sure you miss that straw like hair, dry skin, chapped lips, the dry meals and electrolyte drinks. Thank you for the emails. Although they take a long time to come through, they have been great to read and to know that you have been following my plod through this crazy place. We have just 8 km tomorrow morning into the town centre of Atacama – and then rest and relaxation. So, from stinky me, covered in sand, dust, dry blood, sweat and some tears – I send you lots of love. They call it the Long March and it is certainly that… 72 km. So, we started out at 8 am yesterday morning. Chilly and off again through salt flat broccoli terrain. 15 km to the first CP. I fell into step with Matthew the Aussie. Leah from our tent hung out with us for bit too. Matt and I slogged onto CP2 through sandy, foresty terrain. It might be odd to say we had a dog at our heels, but we did. On Stage 4 from San Pedro, one of the many stray dogs attached itself to the runners and crossed the salt flats with us! It is not easy running in the heat with a very sweet, panting dog at your heels. But, it was determined to follow us… and even had the energy to chase some horses and donkeys that were being exercised. As we trotted into CP2 the poor dog collapsed in a heap. Matt headed straight off. I sorted out a shoe problem and then headed off too. CP2 to CP3 was fantastic. A dusty truck road and then heading off across gravelly rising dunes. It was perfect for running and I ran all the way to CP3, pausing to say hello to Vladmi and his guide as I went past. CP3 to CP4 was more salt crusts and seemed to go on for ever… Then suddenly, a very steep tall dune to climb. The climb was pretty good. What awaited at the top was like a different planet… a terrain that I can’t describe. Like something out of Star Trek… and finally down a sandy stretch into a hot CP4 where we given a lukewarm can of coke! I set off in Matthew’s dust along a dry river bed. Matt was always just going round a bend ahead of me and it felt like we were stuck in a time loop. But, it was beautiful with the late evening sun still burning hot and the colours on the rocks glowing golden. CP5 eventually twisted into view and I treated myself to a hot meal then set off as the sun was setting behind me and the wind began to rise. I fell into step again with Dennis and we made good time to CP6. We got there just as the need to turn on our head torches was fully necessary. Warm clothes on, joined by Serge and Yves, we all set off with the bright full moon rising and the stars coming out. It was tough going and I could feel my energy beginning to fade… But, we made CP7 by 10 pm and gathered ourselves for the final push up through the Valle de la Luna. I’d like to say it was beautiful – and it was under the bright full moon, giving eerie shadows to the rocks and salt all around us. But, my energy was fading fast and if I hadn’t been with the Canadians who kept pushing me on I would have ground to a halt. I was cold and a bit tearful, but we kept plodding on for what seemed the longest 9.7 km ever. We crossed the finish line at about 12.40 am and apart from my amazement that the dog was lying there being fed, I was exhausted and emotional, but so relieved. More updates to come later…. Well folks all I can say at this point is that Salt Flats are not flat! So we started off the day through fairly beastly sand dunes. As the sun warmed up the rocks and dunes, I felt a bit rubbish and breathless and struggled to find my rhythm. So, I had a pit stop just before CP1 to de-sand my shoes by a small river with David from Shanghai. Out of CP1, I caught up with Wannachai from Thailand who is amazing. Then said bye as we headed across the desert. It was iPod time and once I had my tunes playing I was running and almost dancing across the desert through to CP2 where medic Alex changed my arm dressing to a bright blue one. However, he caused it to bleed and then sting like crazy when he put iodine on it! I danced on and on through sandy flats and then a small forest. Great excitement at the end of the forest as I finally saw some Alpacas. Just as we turned into CP3, I trod on a massive thorn. It went right though my shoe! Very painful! I stocked up with the mandatory 3 litres of fluid at CP3 and headed into the salt flats… for 12 km. It is hard to give them a suitable adjective. They are not pleasant to run on. It looks like over-cooked, really crusty crumble topping covered in sugar. And, it goes on forever, and ever and ever and ever. I was alone, although other runners were in view and I got quite emotional. I pulled myself together and ran every two flags, walking one. CP4 eventually appeared and I crunched my way into it and had a bit of a tearful moment as a blister was playing havoc. Watered and fuelled up, I pushed on for the final 10 km. Despite being after 4 pm, the sun was still beating down with no clouds in site… But, a gentle breeze was lifting. The horizon was still flat and went on for miles. At about 3.5 km out, the camp came into view like a cruel taunt as the road twisted this way and that around a beautiful flat salt lake where some bemused tourists were hanging out. I caught up with Dennis from Canada whose wife pulled out at CP2. He said my smile saved him and we finished together and stumbled happily into camp at around 6 pm. Not too many blisters and a fantastic, if challenging day both physically and mentally. But we truly are in paradise as the sun sets over the Salt Flats behind me and the last few runners still come in. Hot beef curry on the menu and my favourite biltong. Another 70 odd km tomorrow and I can’t believe we are nearly at an end. For your info tentmates of MDS 115 – there are no less than 4 crisp packets in my tent!!! To CP1 it was just a chilly start across allegedly ploughed fields… Well, they wouldn’t win any ploughing contests in Cornwall. CP1 was at the Last Tree in the Desert, quite literally. I had taken my time to wake up my tired legs in the morning and get ready for the day. Soon after CP1, I began to find my rhythm along a very long, straight track. I ran for two markers then walked the third, gently passing a few other runners and all the time looking at the mountains and volcanoes rising in the distance. They are quite special as they loom above us. We turned a sharp left off the track and followed a hard crusty tractor track to CP2. As always, I just refueled my bottles and then headed off. We crossed a road supervised by the police no less and then it was the salt flats to CP3. Well flat isn’t exactly how I would describe it. It was like walking over crusty salted broccoli and occasionally your foot went through the surface. I hooked up with Shevaun from Canada and we stuck it to CP3. From there the route to CP4 was amazing but like being on planet Mars and I got into my groove… I felt amazing as I approached CP4, where there was only about 5 km left to go to the end. But what a grueling slog up and down dunes which were hot and dusty. Through a smelly oasis and up two final dunes (where the media truck was stuck!!!) to the camp. Couldn’t help it – had to do a little air jump at the top! It is amazing here. I’m 4th into my tent so far each day. Ian Malcolm is always first followed either by Leah Mink, or Takaaki. Yuta and Masaato follow me into tent – and then it is close between Hideo and Andrew North – who are both still out in the heat on the course at the moment! All well here in the beautiful Chilean desert. Two stages done and both incredible – although I thought my feet had parted company with my body as we crossed the river countless times in the Slot Canyons this morning… It was so cold! Climbing the path up to the top to then overlook the Valley of Death (yes – that really is its name!) was utterly magnificent. I yo-yoed a Canadian couple today… and finally beat them to the finish line in the last 2 km. Yesterday was a baptism by fire with the altitude… The first slog to CP1 was tough. 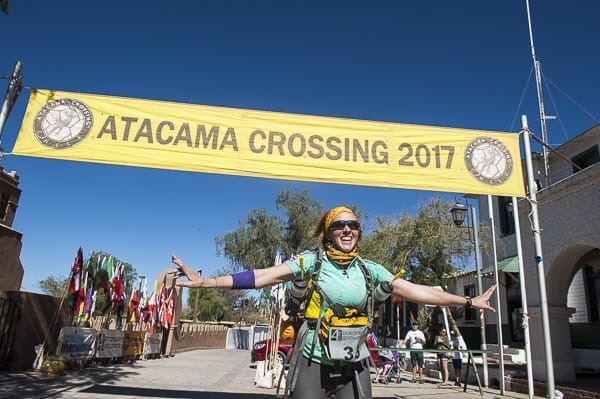 But, I gradually found my rhythm out of the checkpoint and had a blast to CP2… I was clearly over-confident though, because 2 miles out from CP2, I took a quite magnificent tumble and now have massive gash on my right knee and right arm – but, no other damage. Toes are just about OK – trying not to kick too many rocks! We had to decamp to the museum of the Valle de la Luna last night as the wind was so ridiculous that they couldn’t put up the tents (not the skills of the MDS berbers!). It was quite bizarre. Luxuriously, we had flushing toilets! It is cold at night. I am quite snug in my sleeping bag though (thank you Aiden) and on my inflated mat (thank you Kevin). The Japs in my tent don’t speak a great deal of English. But, there is lots of laughter between us. Yuta and I bumped into each other a bit today. He suffered a lot yesterday with the altitude. Fortunately, he’s much better today – in fact I thought he had beaten me today. Surprisingly though, I beat him in to camp (although I don’t know where I passed him). The scenery is like something out of film and in some of the canyons we run through, I keep expecting Butch Cassidy and the Sundance Kid to come galloping past! Well folks – big love to you all – and thank you for the messages that are filtering through. They are not printed out – we look at them on dusty iPads in the cyber-tent! I have just about got through them all! Will update again tomorrow… if it’s not too windy for the cyber-tent!